Abbott should dispatch Rudd this weekend, but he’s likely to find the job of governing altogether harder. Tony Abbott is poised to become Australia’s 27th prime minister after a botched presidential-style election campaign from incumbent Kevin Rudd. Known for his “selfies” photos on social media, the Labor leader has instead suffered from overexposure of a haphazard strategy for the September 7 poll. Reinstalled in June by the center-left party for his reported campaigning prowess, Rudd’s comeback initially helped Labor reach level terms with Abbott’s conservative Liberal-National Coalition. However, the honeymoon soon ended and the opinion polls progressively worsened for Rudd’s party during the five week official campaign, with the latest predicting around a 10 to 15 seat majority in the Lower House for his opponent, nicknamed the “mad monk”. “Labor has run an almost chaotic and certainly in some areas an amateurish and uncoordinated campaign,” Griffith University’s Paul Williams told The Diplomat. The party that has ruled Australia since December 2007 began its re-election campaign on the back foot, with a notional 72 seats in the 150-seat lower house compared to the Coalition’s 75. 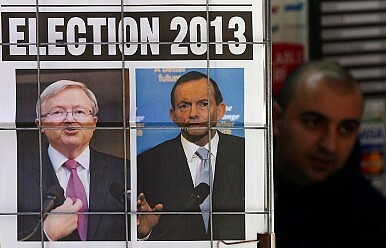 Rudd launched his campaign amid warnings of the end of the China-led resource boom. But while the recycled leader stressed his previous success in avoiding recession during the global financial crisis, analysts instead have pointed to low business confidence, rising living costs and unemployment along with a swelling federal budget deficit. After beginning his campaign promising “a new way” with a focus on school funding, job creation and the national broadband network, Rudd quickly threw the switch to negative mode with attacks on Abbott’s alleged “A$70 billion” worth of cuts to jobs, education and hospitals. Australians had a choice between a “new way for the future…as opposed to the old negative politics and three-word slogans of the past,” he said. Abbott by contrast adopted the slogan of “Choose real change,” asserting that Australia could not afford “another three years like this six years that it’s just had” of political turmoil. “Who is more fair dinkum…The people who have been stable and consistent for the last three years or a government which has been wracked by division and dysfunction?” Abbott asked rhetorically. Yet after adopting his own three-word slogan of “cuts, cuts, cuts” concerning the Coalition’s budget plans, Rudd’s attacks were blunted by his own bureaucrats who issued a public statement denying claims of a “$10 billion black hole” in Coalition savings. Describing the attack as a “spectacular failure,” Tim Wilson of the free market Institute of Public Affairs told The Diplomat that it marked a low point in the campaign. “Normally in politics there are degrees of accuracy and inaccuracy in what politicians say, but it’s normally a matter of context and half truths. The government in this campaign has actually prosecuted attacks on the Opposition which they know are blatant lies,” he said, pointing to the “$70 billion black hole” claim. While both leaders traded blows in public debates, with Abbott famously telling Rudd to “shut up” at one event, neither landed the knockout blow required to sink the other’s campaign. Gaffes included a Liberal candidate from western Sydney who failed to recall the Coalition’s six-point plan, while Rudd sparked criticism for his “thought bubble” announcements concerning shifting Australian naval forces north and creating a special economic zone for the Northern Territory.